As soon as you save a contact or when you select a contact, you’ll be able to see the contact details page. Contact Details displays an overview of the contact with options for more actions. 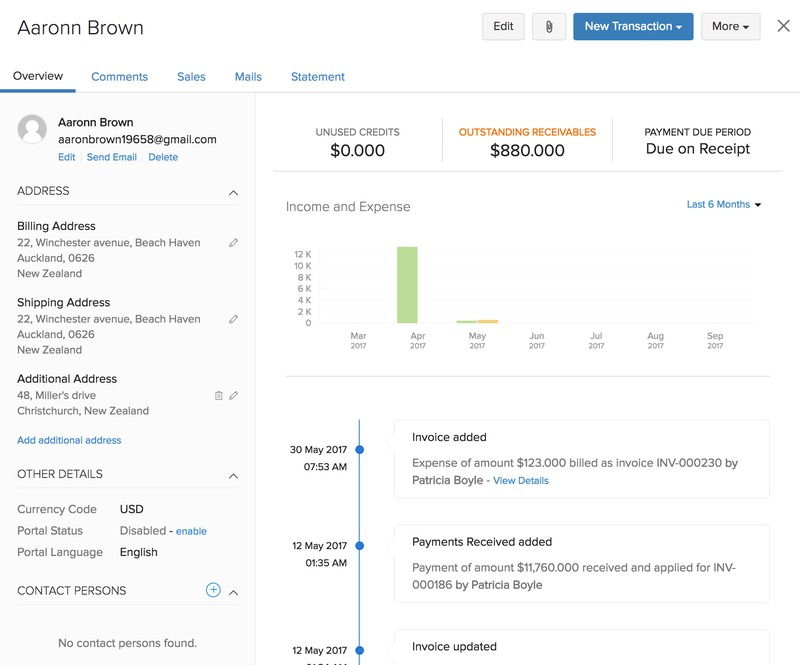 From a contact details’ page, you’ll be able to edit a contact, create transactions for a customer, view recent activities, add additional addresses, add comments for internal use, view customer’s account statement and many more. Let’s look into all that you can do from the Contact details page. You can create transactions such as Estimate, Invoice, Retainer Invoice, Credit Note, Expense, Recurring Expense etc. directly from the Contact details page. Select a contact from the Contacts module. Click the New Transaction dropdown in the top-right corner of the window. Select a module in which you want to create a transaction. The page will redirect you to the creation page of the respective module and you can create the transaction. While doing business with your customer, you might have important documents that you want to attach with a contact. Select the contact to which you wish to upload the documents. Once the attachments are added, you can choose to share it with your customer. 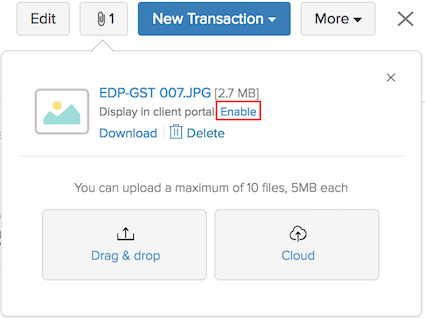 To share the attachment with your customer, click the Enable next to Display in Client Portal option. Now, the shared files will be visible to your customer when he/she logs into the client portal. Hover your mouse over the file and click the Download button to download the document. Click the Delete button to delete the attached document. Insight: You can attach a maximum of 10 files with 5 MB each to a contact. 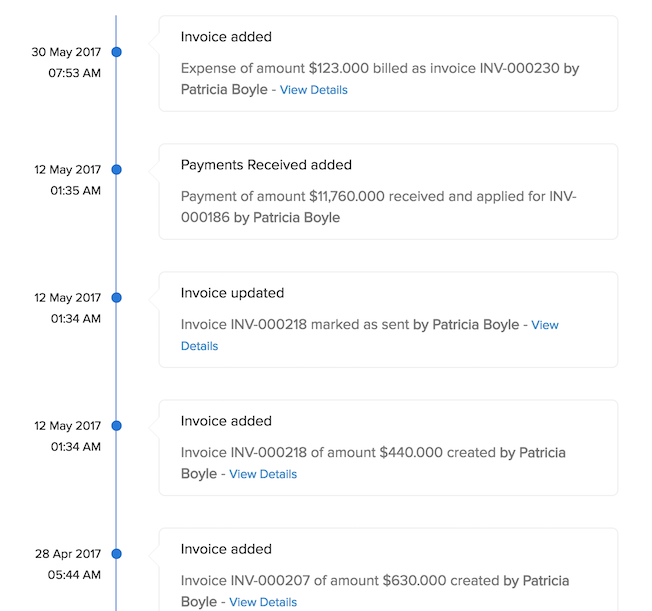 Recent Activities refers to a timeline of events that has happened in Zoho Invoice with respect to your customer. You can view the recent activities related to a contact in the contact details page. Scenario: One of your customers requests for a special discount as he’s a regular customer and you give him a discount of 5% in all the future invoices. You can add it as a comment in his contact which will help you to refer in the future. Similarly, if you want to add a comment in any scenario, you can add the comment in this section. Go to the Contacts module and select the contact to which you want to add a comment. Enter comment and click the Add Comment button. The comment you add will be displayed in the recent activities for your quick reference. 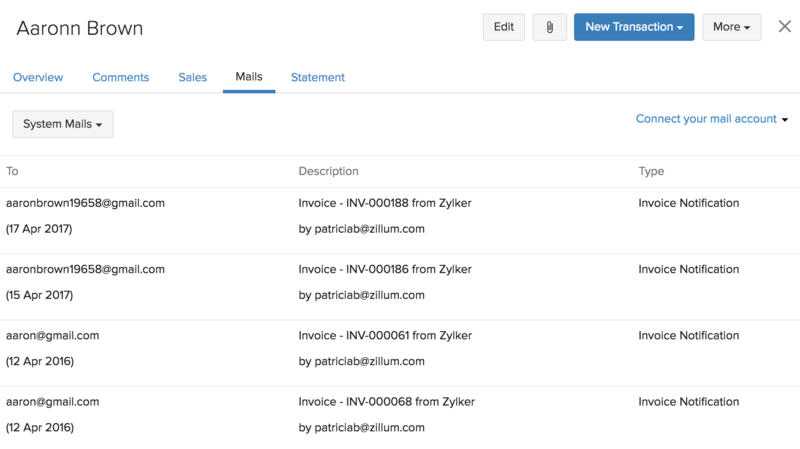 Go to the Contacts module and select the contact whose transactions you want to view. Click the Sales tab to view all the transactions created for the customer. 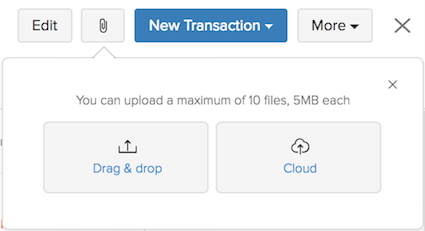 Click the Go to transactions dropdown and select a module to quickly scroll-down to the transactions of that module. Click the Date header to arrange the list of transactions based on date, either from latest to oldest or from oldest to latest. By default, the tranactions are arranged from latest to oldest. 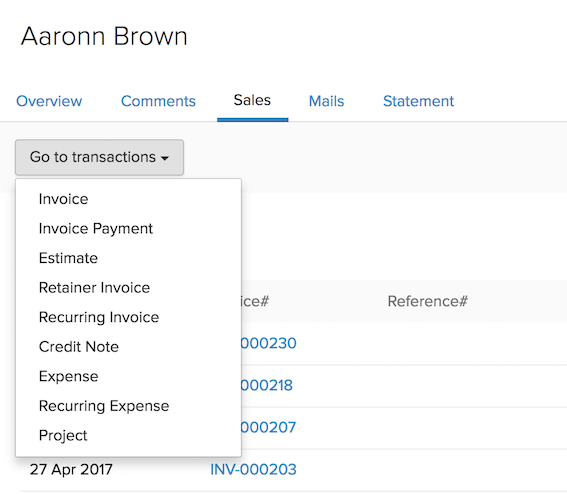 Click Total Count to view the total count of transactions under a specific module. Click the Status dropdown to filter the transactions based on its status. Click a transaction to view it in its respective module. Click + Add New to instantly create a new transaction in that respective module for that contact. 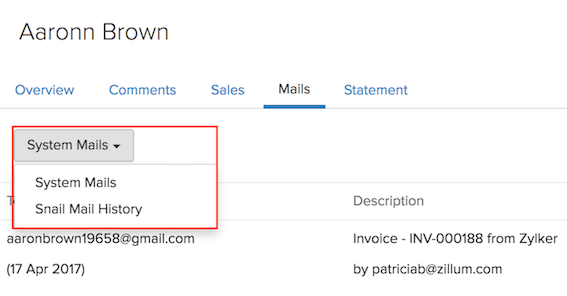 A description of every email that you send to a customer from Zoho Invoice is listed under the Mails tab of a contact. Also, you can see what type of email was sent to the customer. If you’ve configured Snail Mails for your organization and if you’ve sent snail mails to a customer, you can view a description of them under this tab. Also, you’ll be able to connect your Gmail or Outlook or other work account to a particular contact. A description of emails that you would send to this customer from the connected email account will be displayed under this tab. Go to the Contacts module and select the contact whose emails you want to view. Click the Mails tab to view all the transactions created for the customer. Click the System Mails dropdown and select Snail Mail History to view a list of snail mails. By default, system mails are displayed. If you want to connect your Gmail or Outlook or other Work account, click the Connect your mail account dropdown from the top-right corner and select the respective options. Learn more about Email Integration. Customer statement is a summary of all the transactions and payments that took place between the customer and you for a specific period. It gives you an account of the Balance Due amount. This helps you and your customer to keep track of your account and how much they owe you. 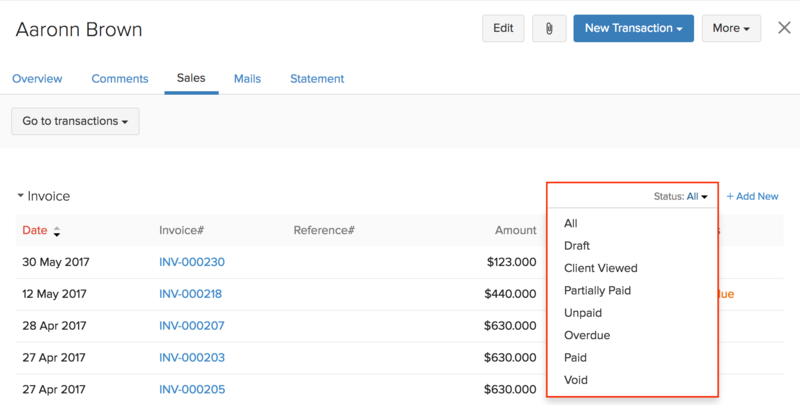 You can send the statement to your customer if they have more than one transaction with pending payments by filtering the statement based on a specific date range. 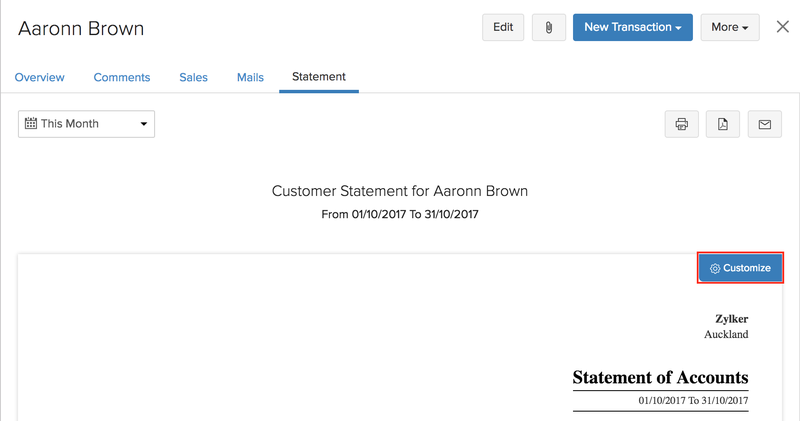 Go to the Contacts module and select the contact whose statement you want to view. Click the Statement tab to view the customer statement. Click the This Month dropdown and select a different date range to view the statement for a different date range. Select Custom to select a specific custom date. By default, the statement is displayed for the present month. You can directly print the statement or download the statement as PDF or email it to your customer from this tab. Click the Print icon in the top-right corner of the statement to print it. Click the PDF icon to download the statement as PDF. Click the Mail icon to send the statement as an email to the customer. In the email preview, edit the content if you want to and click Send. A PDF copy of the statement will be attached to the email that is being sent. 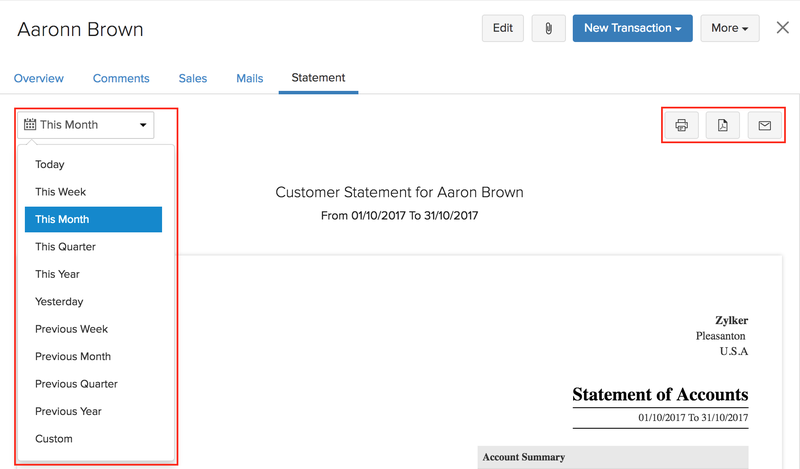 You can customize the Customer Statement template layout according to your desire. This allows you to restrict certain fields or values from being displayed in the statement and other customizations. Hover your mouse over the statement and click the Customize button that on the top-right corner of the statement. This will redirect you to the Template Preferences page where you can edit the template. Learn more about editing a template.